Adrian Ionescu moved all in from the under the gun position with :::Ah:::9s. 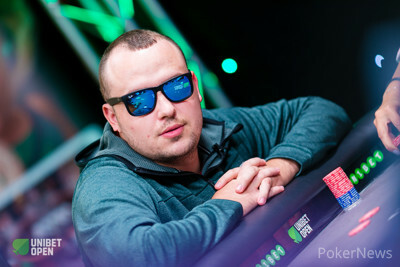 Anton Vinokurov woke up in the small blind with :::Ad:::Ac and called the bet. The player in the big blind folded and it was up to the dealer. The dealer put out the :::5d:::Js:::5h:::6d:::6h board and Ionescu wasn’t able to double up one more time. We’ve lost three players in the past 20 minutes and Vinokurov has a commanding chip lead. Florin Elisei is the second biggest stack and has just 30 big blinds.